You know that feeling when you've finished a race and you just feel so incredibly awesome that you wish you could bottle it and sell it? 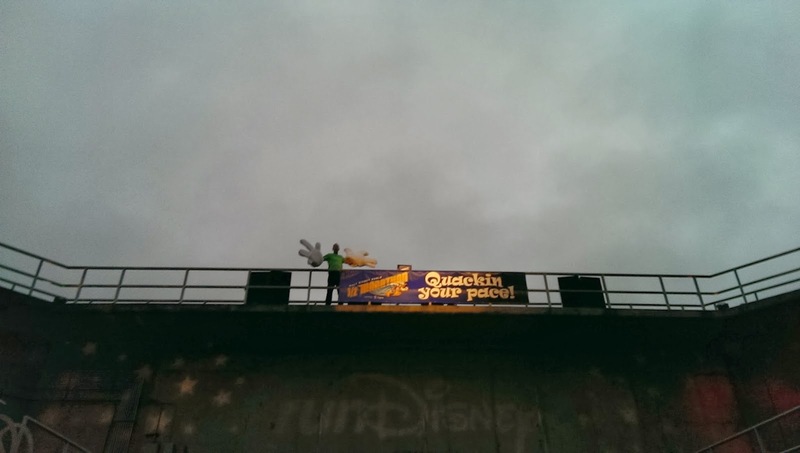 Well, that was the exact opposite of how we felt at the end of the WDW Half. Let's start at the beginning. We woke up for this race a little later than the other two. Since we knew there weren't going to be any characters at the pre-race area, we figured we'd sleep in until 2:30 :-) After having to run back to the room for my forgotten bib (luckily before we got on the bus! ), we arrived at Epcot a little before 4 am and headed straight towards bag check. 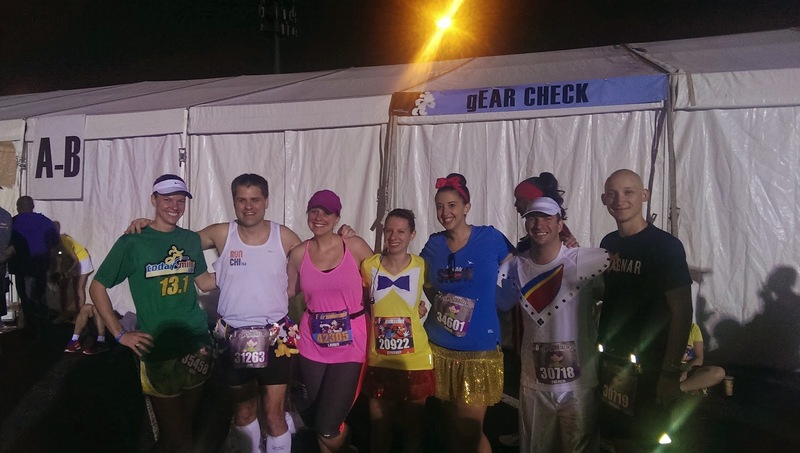 We were meeting a few friends from twitter for a pre-race meet up. And what friends they turned out to be! It was truly fantastic to meet the people I'd been chatting with for the last few months- @lrnbailey, @brandi1369, @jsmerc26pt2, @whatthe5k, @harveymonster, @amieelanter, and @sas_rubel are all awesome and you should follow them! 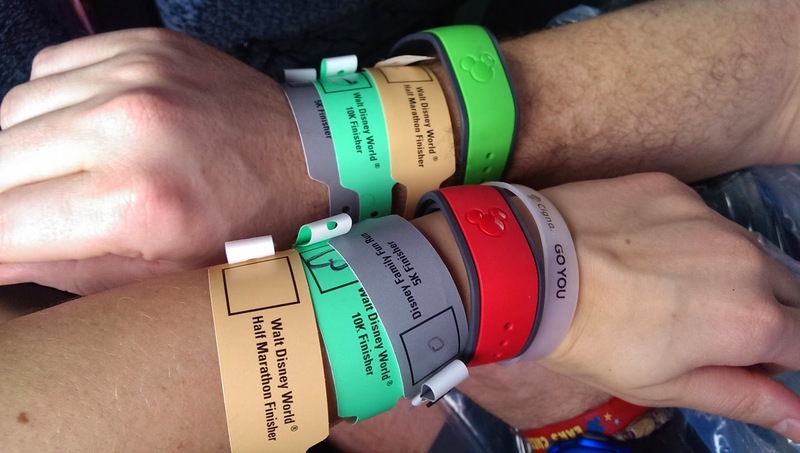 Also, Jeff gave us all rubber Disney bracelets- he saved "Love to Sparkle" for me! Thanks, Jeff! While we were chatting, I noticed Matthew just looked... off. We decided to head back to the corrals. 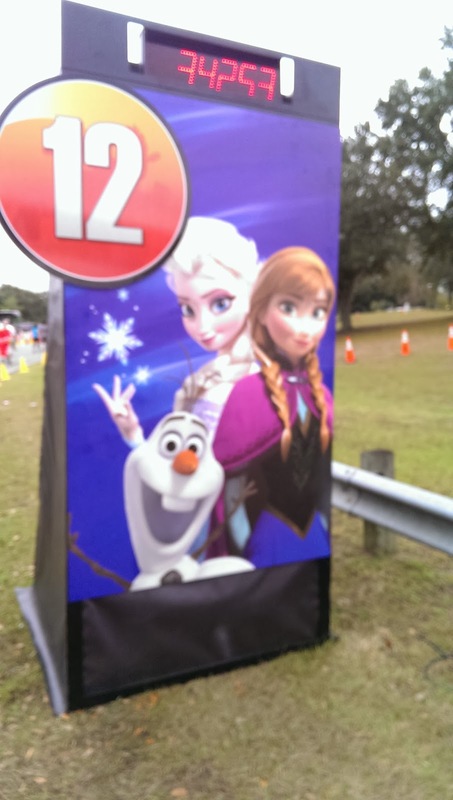 At Disney, you have about a 20 minute walk to the corrals from the pre-race area for the half and full marathons. While we were walking, Matthew really started to feel crappy. His body was aching, he was coughing- not good. He got a dose of Tylenol from a medical tent and we kept walking. Once we were in the corral, we immediately sat down. It was muggy and incredibly humid. I secretly hoped it was the temperature change (it was -2 in Baltimore the day we left) that was making him feel so bad. As we were waiting in the corral, our friend Dave found us from the day before. We all sat around and chatted until the 5:30 start. We also agreed to meet in the same place, same time for the marathon. 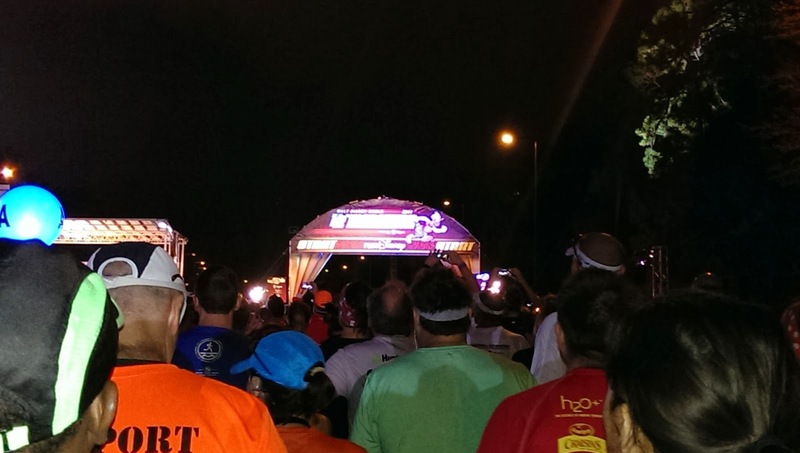 Since we were in corral "L," we didn't cross the start line until around 6:15. 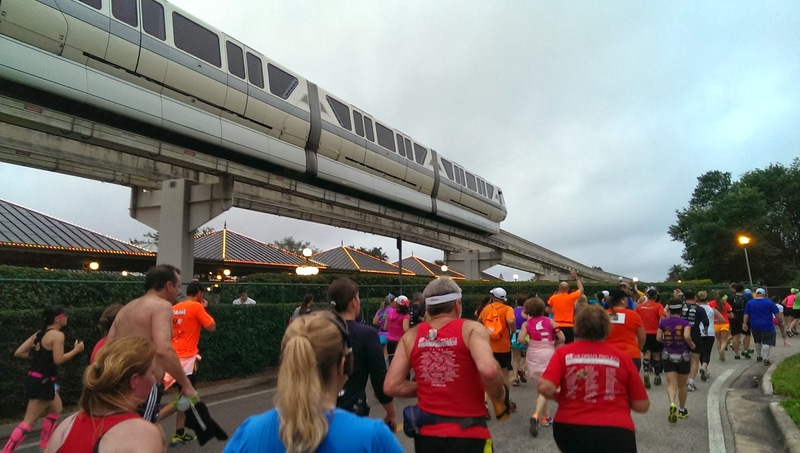 Soon enough, we were at the front of the corrals about to embark on a quick 13.1 run to Magic Kingdom and back. Our new "Perfectly Goofy" friend Dave! 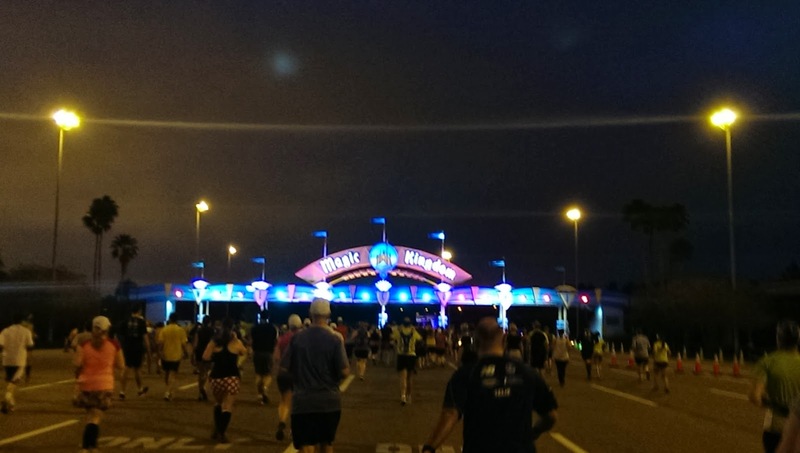 Always a fantastic starting line for runDisney races. 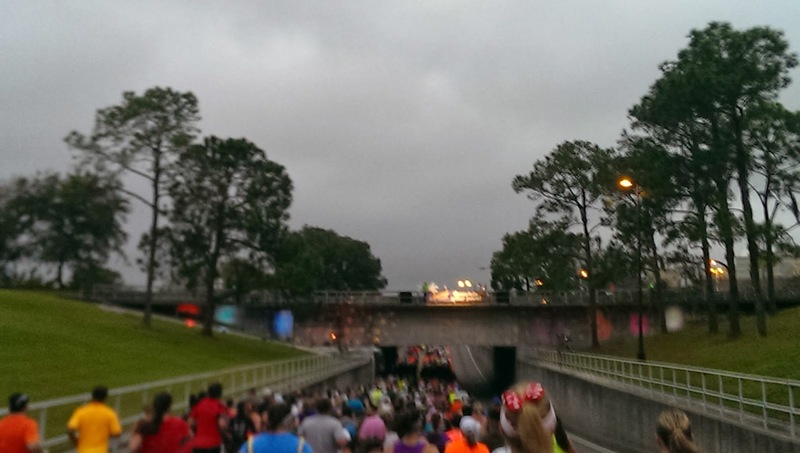 Since we've done this course before, we knew what to expect- a few miles until Transportation and Ticket Center (TTC), then a few miles until Magic Kingdom, and then straight back to Epcot, with a few overpasses around mile 11. What we hadn't counted on was the weather or Matthew feeling awful. In short, this wasn't a very fun race for us. I wasn't feeling it. 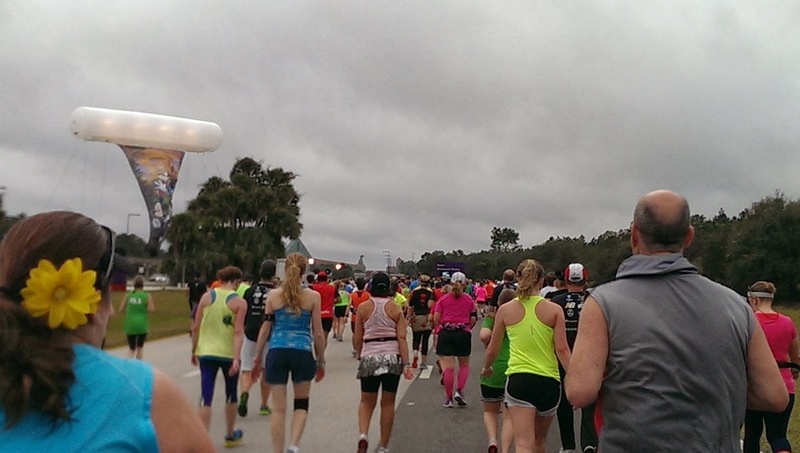 It was humid, my body felt fatigued and sore, and I was desperately trying to stay upbeat for Matthew's sake- I could tell he was just feeling terrible. Luckily, because of all the training we have been doing, we ran this half on autopilot. 13.1 miles doesn't seem like such a long way to go when you've been doing training runs of 17, 20, 23 and 24 miles. Again, we didn't stop for characters (lines were very long) but I did manage to grab a couple of pictures. 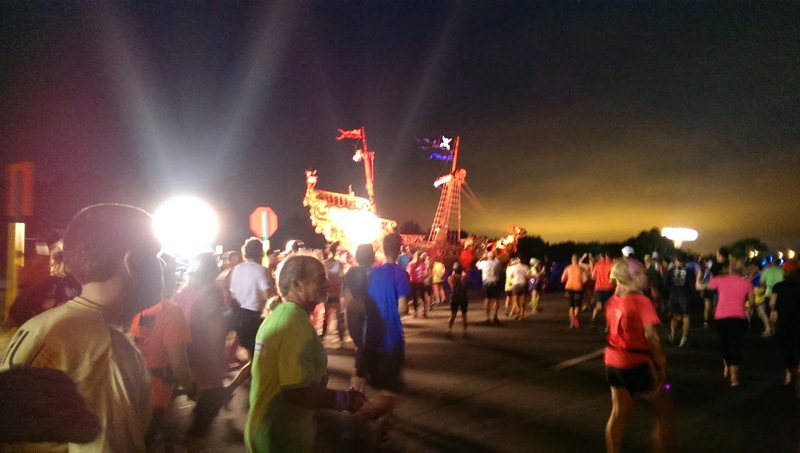 Pirate Ship around mile 2. Great DJ near mile 4. Hooray! The best part of the race! You can see how windy it is by looking at the sign on the left. 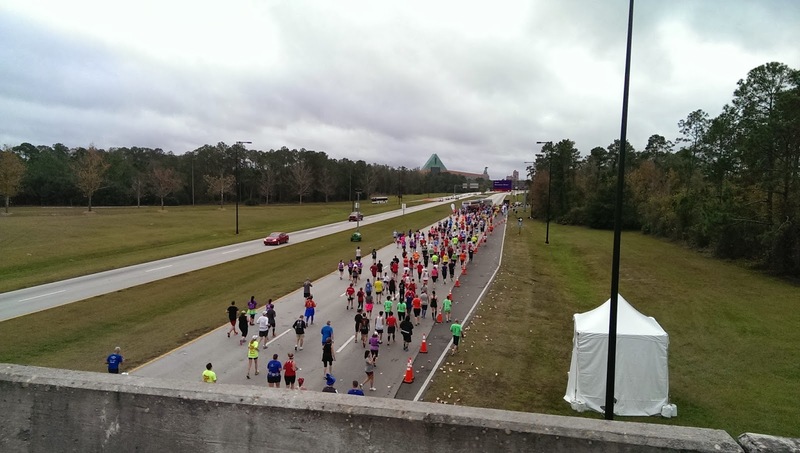 The famous overpass around mile 10. 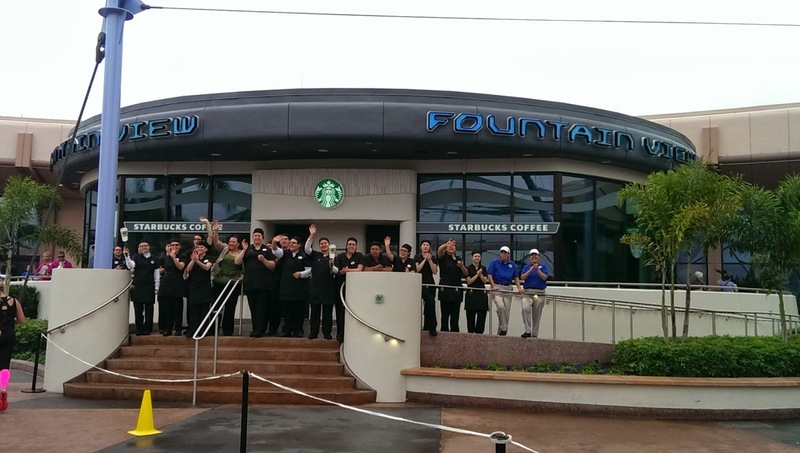 The employees of the new Starbucks in Future World came out to cheer for us! 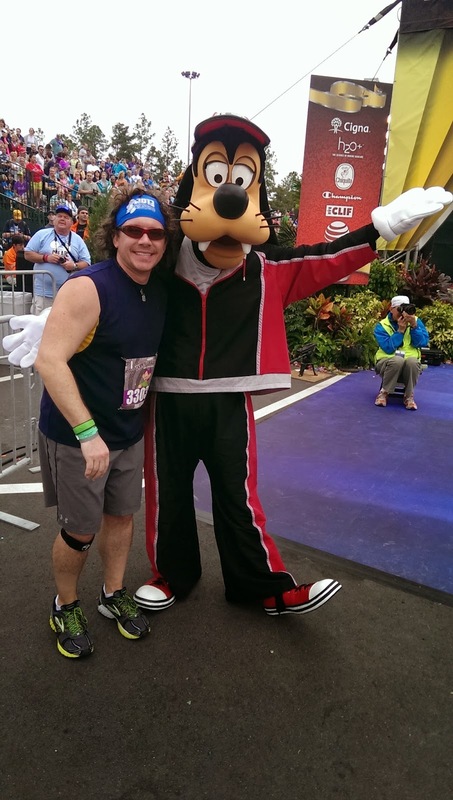 Quick finish line pic with Goofy! 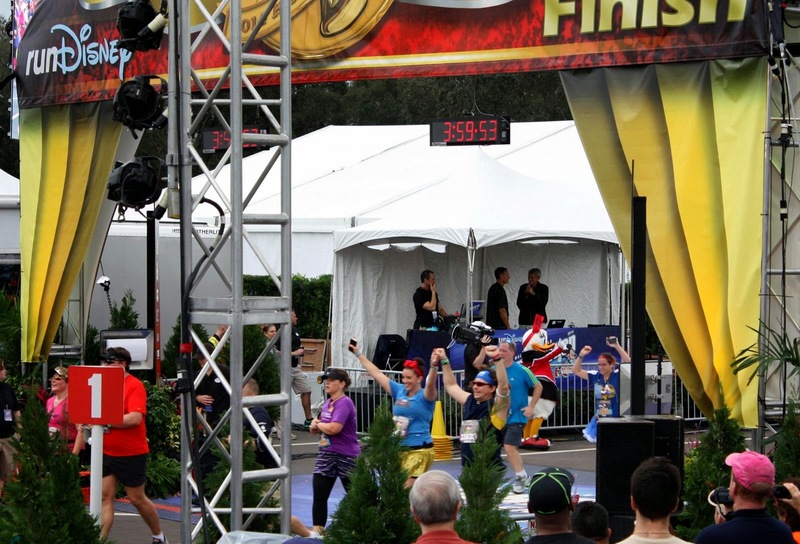 Matthew's family got this GREAT shot of us crossing the finish line! I don't think I've ever been more happy to see a finish line! By this point, Matthew was really sick. I started to get really worried about him for the race tomorrow. I was also worried about myself- my body felt terrible. I felt untrained, tired, and unmotivated. And scared. If we were feeling this way today, how would we ever be able to complete 26.2 miles the next day? We got our medals and then went through the lines to add another bracelet to our ever-growing collection. 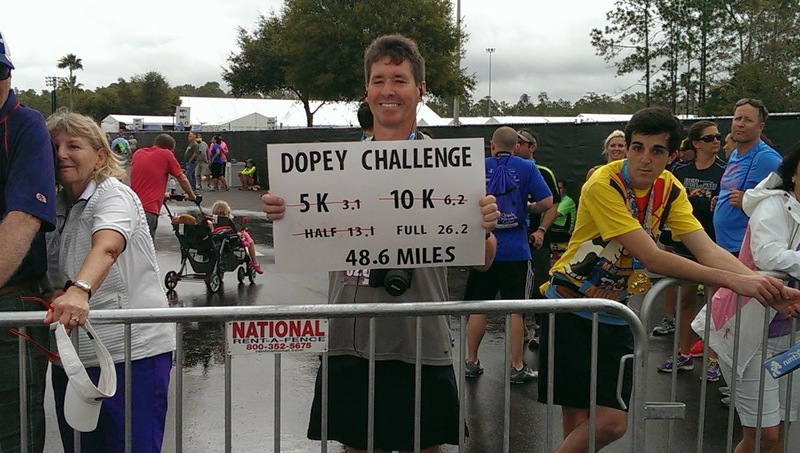 I saw a man with a Dopey Challenge sign and had to get a quick picture. 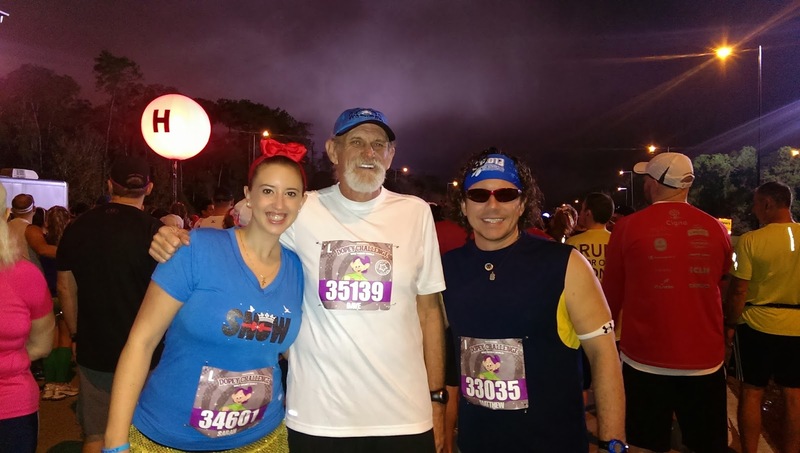 We made our way back to our resort, rested, ate, and got our stuff ready for the next morning's race. To say we were nervous was an understatement. We gave Matthew as much medicine as we could- luckily his mom is a nurse so she was able to help us figure out what to give him. Going to sleep that night was relatively easy- we were both exhausted. We just hoped we'd feel better in the morning and have a good race. 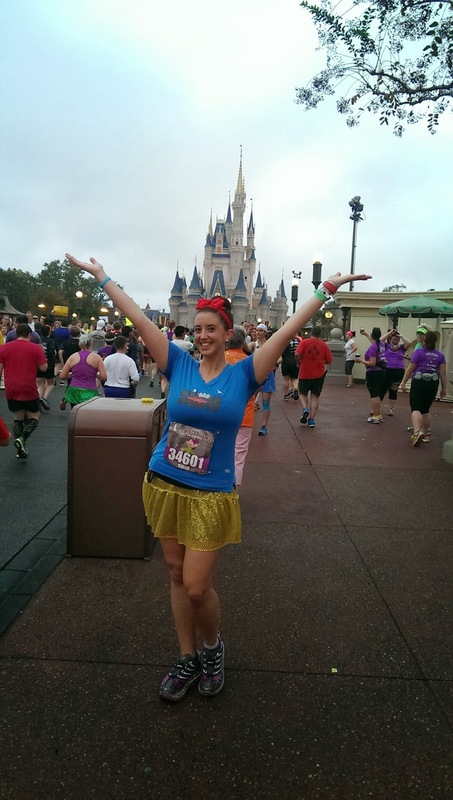 I can't explain how frustrating it is to have trained so hard for an event and then to feel terrible while completing the event; especially when in Walt Disney World. We both put out a call for support on social media and were absolutely flooded with responses! Runner friends in the area offered to go off-property to get Matthew medicine, other friends at home included us in their prayers. We were truly touched by the encouragement and support from all of our cheering section. Oh no! How frustrating! I hope things got better by the next day for you both. I've had races that I've just not even gone to if I was sick. It's a difficult decision either way.